the first week of the month was a review week of all the material covered in Science, Social Studies and Grammar classes this semester. Students put a lot of effort in their classroom preparation; asking questions and engaging in conversations. By the end of the week, I was confident that the students would do well on their Midterms. The second week of the month was mostly focused on our Midterms exams. Students were extremely busy in both of their schools and even though they were tired, they all did well! During our third week, we finished our study of habitats with the desert. Students were then able to compare and contrast all environments studied in the chapter. During the chapter review, students were able not only to describe forests, oceans, wetlands and deserts, but they were also able to talk about the different living things we could find in each of them. In Social Studies we continued learning about the World of Work. The third week of the month we studied the difference between selling, buying, trading and saving. All students agreed that we must save in order to buy what we really need and want. Our last lesson of the month was about all kinds of jobs and how everything around us must be made, operated and taken care of by people performing different jobs. It was interesting to think about all the jobs out there! In Reading classes, we focused on Cause & Effect and students really enjoyed reading the Little Rabbit’s Tale. It helped them think of their own story and how they could apply the new reading skill to their own writing. This month, we finished another Writing Project focusing mainly on Cause & Effect. 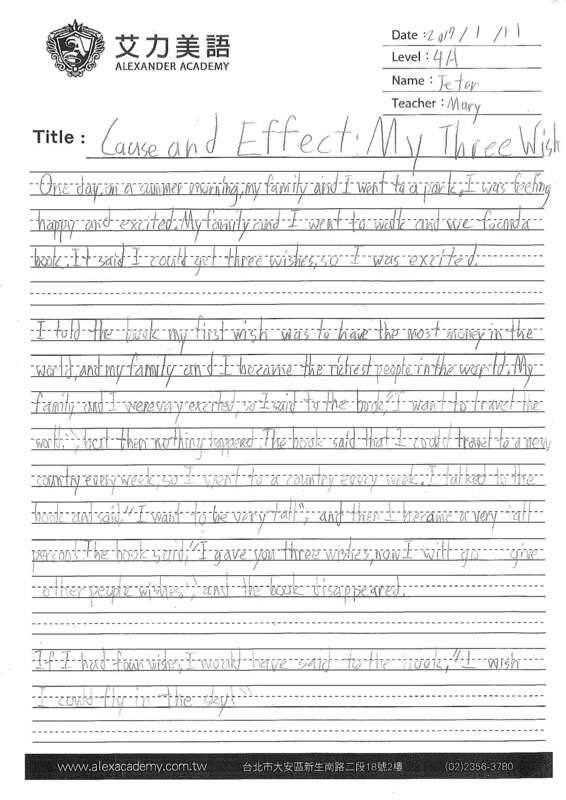 Students wrote about what would happen if they were granted three wishes. Attached, you can find a few stories written by the students about their Three Wishes. We finished our month learning about poems and rhymes and students enjoyed reading and writing silly rhymes even if it wasn’t an easy task. We did not get to study a new country every week this month, but we carried on studying the southern part of America. We will continue to do so in February, before moving on to Europe. Keep up the good work, L4A!